ILRI was honoured by a visit this week to ILRI by Julie Borlaug (left) and Jeanie Borlaug Laube, granddaugher and daughter of Norman Borlaug, respectively (credit for this and all photos in this article: ILRI/Susan MacMillan). Staff of the International Livestock Research Institute (ILRI) were delighted that the Borlaug family managed to include a visit to ILRI’s Nairobi headquarters this week (Wed 15 Mar 2017) during a trip they are making to Kenya. Julie Borlaug, granddaughter of Norman Borlaug, associate director of the Norman Borlaug Institute for International Agriculture at Texas A&M AgriLife Research, with her son Luke. Julie Borlaug, granddaughter of Iowa native, Nobel Peace Prize laureate and father of the Green Revolution Norman Borlaug, is associate director for external relations at the Norman Borlaug Institute for International Agriculture, part of Texas A&M AgriLife Research. Since the passing of her grandfather in 2009, Julie Borlaug has worked to continue his legacy through developing agricultural partnerships between public, private and philanthropic groups to further the Borlaug legacy and expand upon his mission to feed the world’s hungry. Julie received her BA from Texas A&M in international studies and political science in 1997 and her MBA in nonprofit management from the University of Dallas in 2004. She has spent her career in the nonprofit sector, championing her grandfather’s legacy, particularly his desire to see more successful collaborative partnerships between the public and private sectors to ensure a continued stream of breakthroughs in international agriculture and in the international research that is its foundation. The work of the Bill & Melinda Gates Foundation and the U.S. Government’s Feed the Future initiative have helped raise the profile of agriculture once again. Over the past two years, U.S. leadership has mobilized the world to focus on these issues and bring science and innovation to bear to solve them. My grandfather believed that everyone has the moral right to food and an education. Business as usual won’t adequately address the challenges we face in feeding the world or get us to this reality. We need fresh ideas and open minds. Fear of change is one of our greatest obstacles to ensuring there is enough food to feed 9 billion. The next generation of ‘hunger fighters’—as my grandfather called them—doesn’t have this fear nor do they believe that these issues are unsolvable. They are optimistic, compassionate, driven, creative and concerned about international issues. . . . It is their families, incomes, livelihoods and world that will be directly affected by the looming challenges of food security in the future. Philanthropist and teacher Jeanie Borlaug Laube, mother of Julie Borlaug and daughter of Norman Borlaug. Jeanie Borlaug Laube, daughter of Norman Borlaug, is a philanthropist and teacher in Dallas, Texas. Since 2009, she has served as chair of the Borlaug Global Rust Initiative, an international consortium of over 1,000 scientists from hundreds of institutions working together to stem the threat of wheat rusts. 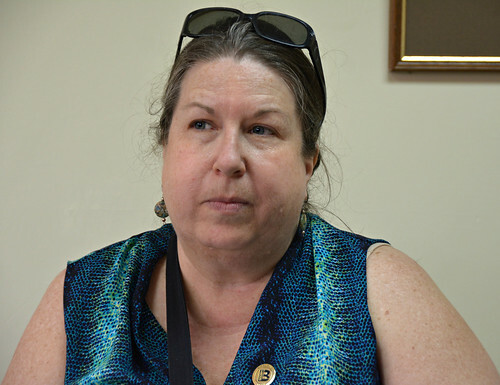 Just before departing ILRI, Jeanie Borlaug Laube reminded her hosts that in the last days of her father’s life, Norman Borlaug was consumed with worry about Africa. He told everyone who would listen that they must ensure a green revolution occurs in Africa as well as Asia and Latin America. Dr. Borlaug’s last words were ‘Take it to the farmer’. Just before that, he said, ‘I have a problem: Africa’, referring to his unfulfilled goal of bringing enhanced agricultural production to that continent. Someone who has taken both of these injunctions of Norman Borlaug—to take it to the farmer, and to take it to Africa—to heart is Andrew Mude, an ILRI economist who leads an index-based livestock insurance (IBLI) project for the never-before-insured pastoral livestock herders living in the vast and remote drylands of northern Kenya and southern Ethiopia. This novel insurance is today helping to protect the livestock herding communities in the Horn of Africa from the devastating effects of an on-going drought. Mude won the 2016 Norman Borlaug Award for Field Research and Application, which was presented to him in Des Moines, Iowa, on 12 Oct 2016, during the World Food Prize/Borlaug Symposium events. Like Norman Borlaug’s pioneering work, Mude’s pubic-private pastoral livestock insurance scheme combines scientific research, policy, community outreach and education—all with a willingness to embrace unconventional solutions. This comprehensive approach was launched in 2008 by Mude and his team at ILRI, who were joined by colleagues from Cornell University and the BASIS Assets and Market Access Collaborative Research Support Program, based at the University of California at Davis and funded by the US Agency for International Development (USAID). Eight-year-old Luke Borlaug, son of Julie Borlaug, grandson of Jeanie Borlaug Laube and great-grandson of Norman Borlaug. 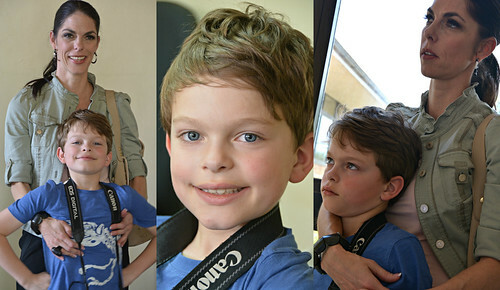 Luke Borlaug, the eight-year-old great-grandson of Norman Borlaug, was paying his second visit to a CGIAR centre on this East Africa trip. Susan Johnson, program director of Borlaug LEAP. Accompanying the Borlaug family on this visit to ILRI was Susan Johnson, program director for Borlaug Leadership Enhancement in Agriculture Program (LEAP), based at the University of California at Davis. Top: Vish Nene, co-leader of ILRI’s program on Animal and Human Health, gave ILRI’s Borlaug visitors an overview of the program while Luke Borlaug took photographs. Bottom: Josephine Birungi (centre back), technology manager of the Biosciences eastern and central Africa (BecA)-ILRI Hub, took the visitors on a tour of the Hub. Luke, Julie and Jeanie Borlaug, accompanied by Susan Johnson (back left), of Borlaug LEAP and UC Davis, are given a tour of ILRI’s state of the art biosciences facilities by Josephine Birungi (right), technology manager of the BecA-ILRI Hub. The Norman E Borlaug Leadership Enhancement in Agriculture Program (Borlaug LEAP) awards fellowships to outstanding graduate students who show strong promise as leaders in the field of agriculture and related disciplines. The Borlaug LEAP Fellowship honours Norman Borlaug, who felt strongly that mentoring by a US university faculty member and a CGIAR scientist offered differing perspectives that have a positive impact on a person’s career. Borlaug LEAP is managed by the University of California, Davis (UC Davis). The United States Agency for International Development (USAID) provides funding support for Borlaug LEAP through the US Government’s Feed the Future Borlaug 21st Century Leadership Program. The Borlaug LEAP offers fellowships to enhance the quality of thesis research of graduate students from developing countries who show strong promise as leaders in the field of agriculture and related disciplines. The program supports engaging a mentor at a US university and a CGIAR centre. 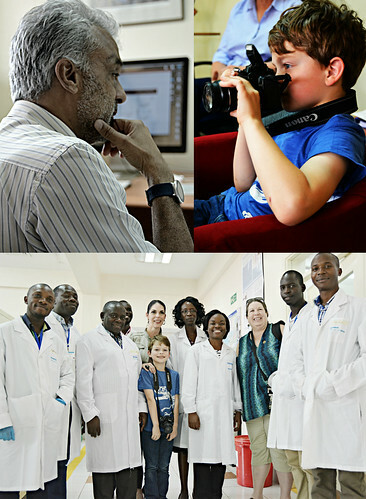 Awards are made on a competitive basis to students who show strong scientific and leadership potential, have a well coordinated proposal between their home university, a US university mentor and the CGIAR mentor, and whose research has relevance to the national development of the student’s home country or region. The award level is USD20,000 for a maximum of one year. On their ILRI tour, the Borlaug family and Susan Johnson meet several research fellows working at the BecA-ILRI Hub, including (bottom, left) 2014 Borlaug LEAP fellow Blessing Odogwu, who in 2016 won an Africa Biosciences Challenge Fund (ABCF) Fellowship to conduct part of her research at the BecA-ILRI Hub. 19 Borlaug LEAP Fellows have been mentored by ILRI scientists since 2006. The 19 scientists listed below were selected as Borlaug LEAP Fellows to be mentored at ILRI over the past decade (2006–2016). ILRI’s Borlaug LEAP Fellows come from 12 countries—Burkina Faso, Democratic Republic of Congo, Ethiopia, Ghana, Ivory Coast, Kenya, Niger, Nigeria, Mozambique, Rwanda, Tanzania, Thailand—and represent some 16 research fields—from anthropology (adaptation to climate change in Africa’s drylands) to virology (resistance to Newcastle disease in chickens), from animal nutrition (feed resources for scavenging chickens in southern Mozambique) to vaccine development (bacterial delivery systems for a vaccine against East Coast fever in cattle in Africa), from animal genetics (identifying heat stress in African cattle) to ecological economics (assessing water and disease impacts at the human-livestock-wildlife interface in Tanzania), and from plant pathology (aflatoxin contamination of maize) to natural resource management (determining agropastoral household reliance on livestock for food and income in Niger). The ‘mentor universities’ of ILRI’s Borlaug LEAP Fellows include 12 of the finest agricultural institutions in the US—Colorado State, Cornell, Iowa State, Purdue, Texas A&M, and the universities of California at Davis, Connecticut, Iowa, North Carolina at Chapel Hill, Vermont—and the home institutions of the Fellows are 9 of Africa’s leading universities—Addis Ababa and Hawassa in Ethiopia; Ahmadu Bello and the Federal University of Agriculture in Abeokuta, Nigeria; Egerton, Jomo Kenyatta University of Agriculture and Technology, and Kenyatta University in Kenya; Sokoine University of Agriculture in Tanzania; and the University of Kwasulu-Natal in South Africa. Elisabeth Nebie, from Burkina Faso, is a 2016 Borlaug LEAP Fellow in anthropology at the University of North Carolina at Chapel Hill (her US mentor institution). Nebie’s work is identifying sustainable pathways to climate change adaptation in African drylands. Temesgen Desalegn Darago, from Ethiopia, is a 2016 Borlaug LEAP Fellow in animal nutrition at Hawassa University, Ethiopia. His US mentor institution is Colorado State University. Darago’s research is improving the productivity of ruminants through proper nutrition in the lowlands of Ethiopia. Tamrat Degefa, from Ethiopia, was a 2014 Borlaug LEAP Fellow in veterinary obstetrics and gynecology at Addis Ababa University, Ethiopia. His US mentor institution was Iowa State University. Degefa’s research studied improved reproduction among unimproved Boran and Boran X Friesian cattle in Ethiopia. Akuffo Amankwah, from Ghana, was a 2013 Borlaug LEAP Fellow in agricultural economics at Purdue University (his US mentor institution). Amankwah conducted a comparative study of aquaculture best management practices and adoption in Kenya and Ghana. Filomena Dos Anjos, from Mozambique, was a 2013 Borlaug LEAP Fellow in animal nutrition at the University of Kwasulu-Natal, South Africa. Her US mentor institution was the University of Missouri-Columbia. Dos Anjos’ research investigated feed resources for scavenging chickens in southern Mozambique. George Tinega, from Kenya, was a 2013 Borlaug LEAP Fellow in bioinformatics and molecular biology at Jomo Kenyatta University of Agriculture and Technology, Kenya. His US mentor institution was the University of Texas Health Science Center. Tinega researched the genetic diversity of Salmonella isolated from pigs. Oyeyemi Ajayi, from Nigeria, was a 2012 Borlaug LEAP Fellow in animal genetics from the Federal University of Agriculture, Abeokuta, Nigeria. His US mentor institution was Cornell University. Ajayi’s research investigated responses to climate change, specifically by identifying and analysing heat stress genes in Bos indicus and Bos taurus cattle. Lauretta Ngere, from Nigeria, was a 2012 Borlaug LEAP Fellow in animal breeding at Texas A&M University, AgriLife Research and Extension Center (her US mentor institution). Ngere researched genetic enhancement of ruminant resistance/tolerance to internal parasites. Samuel Mutiga, from Kenya, was a 2012 Borlaug LEAP Fellow in plant pathology and plant microbe biology at Cornell University (his US mentor institution). Mutiga determined the prevalence and factors for aflatoxin and fumonisin accumulation in maize. Lydia Gatere, from Kenya, was a 2009 Borlaug LEAP Fellow in soil and crop sciences at Cornell University (her US mentor institution). Gatere researched a socioeconomic model for biodiversity conservation in Zambia. Caroline Wambui, from Kenya, was a 2007 Borlaug LEAP Fellow in animal sciences at Egerton University, Kenya. Her US mentor institution was Texas A&M University, AgriLife Research and Extension Center. Wambui’s research determined tree browse species that improve ruminant nutrition. Michel Masozera, from Rwanda/Democratic Republic of Congo, was a 2007 Borlaug LEAP Fellow in ecological economics at the University of Vermont (his US mentor institution). Masozera’s research analysed the economic impact of water management and diseases on the livelihoods of agropastoralists and pastoralist communities at the human, livestock and wildlife interface in the Rungwa-Ruaha landscape of Tanzania. Moses Okpeku, from Nigeria, was a 2007 Borlaug LEAP Fellow in animal breeding at the University of Agriculture, Abeokuta, Nigeria. His US mentor institution was the University of Connecticut. Okpeku studied the genetic diversity of southern Nigerian goats using microsatellite markers. Sommarat Chantarat, from Thailand, was a 2007 Borlaug LEAP Fellow in economics at Cornell University (her US mentor institution). Chantarat’s research investigated the demand for ‘index-based livestock insurance’ among pastoralists in Kenya. Daniel Kerage, from Kenya, was a 2006 Borlaug LEAP Fellow in biotechnology and biochemistry at Kenyatta University, Kenya. His US Mentor institution was the University of Iowa. Kerage’s research evaluated the potential of the bacterium Listeria monocytogenes as a vaccine carrier to stimulate cytotoxic T lymphocyte responses against antigens of T. parva, the pathogen causing fatal East Coast fever in cattle in Africa. Mamadou Chetima, from Niger, was a 2006 Borlaug LEAP Fellow in animal science, environmental information science and natural resources at Cornell University (his US mentor institution). Chetima’s research evaluated changes in how agropastoralist households rely on livestock for food and income generation in Niger. Jeanne Coulibaly, from the Ivory Coast, was a 2006 Borlaug LEAP Fellow in agricultural economics at Purdue University (her US mentor institution). Coulibaly’s research determined the welfare effects of freer trade in dairy on the Ivorian economy and dairy sector. 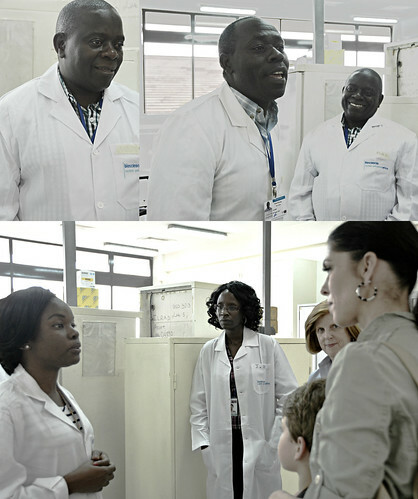 Josephine Birungi (left) gives ILRI visitors Julie and Luke Borlaug, a quick tour of the BecA-ILRI Hub facilities. In addition, the following Borlaug LEAP Fellows, mentored by scientists at other CGIAR centres, have conducted their research at the BecA-ILRI Hub. Blessing Odogwu Nwokocha, from Nigeria, was a 2014 Borlaug LEAP Fellow in plant breeding and biotechnology at Makerere University, Uganda. Her US mentor institution was Michigan State University. Her CGIAR mentor institution was the International Center for Tropical Agriculture (CIAT). Odogwu’s research investigated resistance to rust (Uromyces appendiculatus [Pers.Pers.] Unger] in the common bean (Phaseolus vulgaris) in Uganda. Gerardine Mukeshimana, from Rwanda, was a 2011 Borlaug LEAP Fellow in plant breeding, genetics and biotechnology at Michigan State University (her US mentor institution). Her CGIAR mentor institution was the International Center for Tropical Agriculture (CIAT). Mukeshimana’s research dissected the genetic complexity of drought-tolerance mechanisms in the common bean (Phaseolus vulgaris L.). Mukeshimana went on in 2015 to become Rwanda’s Minister of Agriculture and Animal Resources. Charity Mutegi, from Kenya, was a 2006 Borlaug LEAP Fellow in food safety and food security at the University of KwaZulu Natal, South Africa. Her US mentor institution was Pennsylvania State University. Her CGIAR mentor institution was the International Crops Research Institute for Semi-Arid Tropics (ICRISAT). Mutegi’s research determined the risk exposure to aflatoxin from consumption of groundnut among households in Kenya. Mutegi went on to receive the 2013 Norman Borlaug Award for Field Research and Application. Read about the Biosciences eastern and central Africa-ILRI Hub (BecA-ILRI Hub). Read about ILRI’s Index-Based Livestock Insurance (IBLI) project. Tags: Andrew Mude, Borlaug LEAP, IBLI, Josephine Birungi, Julie Borlaug, Norman Borlaug, Norman Borlaug Award for Field Research and Application, Vish Nene. Bookmark the permalink.